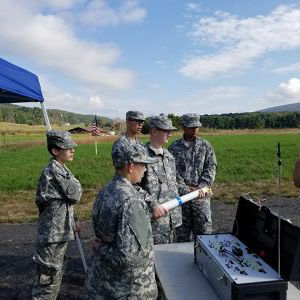 Monterey, VA – recap by CPT Galloway – Last Saturday was as fine a day as one can find this side of the Mississippi for launching rockets and the Fishburne Military School Rocketeers took full advantage. This year’s Team America Rocketry Challenge (TARC) Team had only one veteran Caisson rocketeer at the launch last weekend but he was very helpful in initiating the new members. Daniel Watson (Newport, RI), having been the Caissons’ logistics guy last year, stepped up nicely to fill the shoes of Team Manager being that more senior veterans could not attend Saturday’s launch. Newcomers Xiaoyu Chen (Wuhan, China), Mohammed Al-Hamary (Dhahran, Saudi Arabia), William Waddell (Bridgewater, VA), and Andrew Watkins (Ironton, OH) were quick studies and managed to complete three flights. The Cadets used these launches to gauge how accurate thier chute deployment fall rates were, and to gauge what size motors the club will need this year. The Fishburne Military School Rocketeers also began the process of redesign in order to cut more weight and improve aerodynamics. “We’ve got a great foundation to build upon and this should prove to be an exciting year. We still have room for one or two more cadets and hope to attract more rocketry enthusiasts,” notes team coach CPT Tom Galloway. This year TARC will commemorate the Apollo-11 mission with an altitude goal of 856 feet (the time Neal Armstrong set foot on the moon) and cargo requirement of three eggs (one for each astronaut). The Fishburne Military School rockets will also sport three chutes, as in the Apollo mission, and will be graded on designs most closely reminiscent of the Saturn-V.
“However, after last Saturday’s launch, this year’s mission is looking more like the return trip of Apollo 13 in that we will have to strip our rockets to the bare bones, and then a little more, to stay under the 650 gram maximum for this year.” says Galloway. The FMS Rocketeers are on the case and have begun round two of the engineering cycle with ideas of how to cut a few more grams off their rockets. The Team’s rockets last weekend weighed in at 650 and 652 grams. The next launch is November third and with luck the weather will be as pleasant as last Saturday.